When I say ‘out of mind’, I mean to say that I was ‘literally out of it’ when CIRCUIT was born. It was an experience that involved a sensation of floating outside the mind, from where I was able to live my life, far better than ever. Manifesting ideas with economy had never been as easy or smooth. This was after 1.5 years of long distance travels, full of breath practice and inquiry into the mind, with few interactions with the outer world. The breath community I encountered in February 2012 included about 40 people. We travelled through South Africa, Turkey, the Netherlands, and Switzerland, sharing the breathwork technique that has proved itself to be transformational by ancient wisdom. Spending time with breath practices [and coaching, mindful questioning], and alike minds, visiting eco-villages, and being exposed to the woods of inspirational South Africa, made it possible for me to have a true experience of mindful and sustainable living. During this period I encountered an infinite amount of ‘first-time’ experiences... And this period became a personal focal point in my life. When I returned to my home city, Istanbul, I knew that I wanted to integrate some of the things I encountered and collected during my travels. I also had the need to compensate for the negative impacts of my own unconscious consumerism [mainly clothes] and began to develop ideas around how to represent “change” with the resources in hand. This is how and why I founded CIRCUIT [with its former name Closet Circuit]. A Living Example of Creative Sustainability in Cukurcuma, Istanbul. It was June 2013 when my ideas finally evolved into a concept which I called ‘sustainable creativity’. Yet I did not have any plans about how to proceed nor did I have any ideal forms in mind for this concept. The concept included having an [online] store in which secondhand, upcycled and environmentally friendly products would be found. I was strongly influenced by permaculture principles. The fact that highly intelligent ecological design could turn waste into resources, presented me with a whole new approach towards life. I wanted to create something that would stand out as a living example emphasising the three R’s of the environment. During those days, my utopian wish was to own a 3-storey building in which I could have a sustainable store, a place to give breath sessions, and a space to live in. The idea of a lifestyle centre appeared only after I was given a run-down 3-storey building for a small, symbolic amount of rent. During my first visit to the building, just across the entrance on the wall, I noticed a stencil print saying, “ I had to wait for nothing”. Nothing was utopian. Since this was really happening and not utopian at all, I said yes to renting this building. 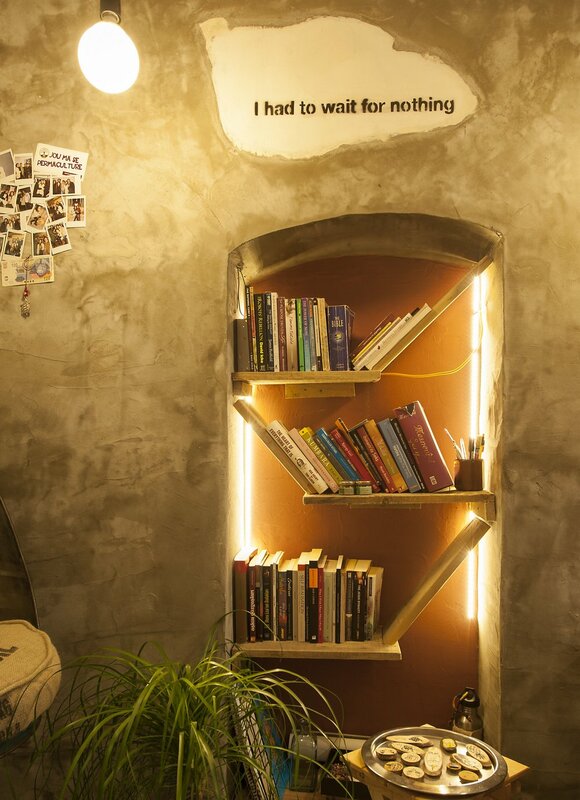 We re-decorated it fully with secondhand and upcycled furniture [except toilets], and along with some small renovations, created a living example of a more-sustainable urban space consisting of a lifestyle store and a breathouse *NEFESHANE a place for breath sessions and other alternative practices. I did not expect not to generate income but I was mainly interested in creating impact. It may look like an social entrepreneurship but I would call this project as an ongoing quest for discovering and creating possibilities. At that time, I would have best described the project as a 'personal manifestation' I wanted to represent my own change and show that it was possible. For this ultimate vision, CIRCUIT was my medium. through and around which I started discovering and creating possibilities. Later, the 3rd floor of this building became an Airbnb flat which increased the number of people interacting with space. While dreaming of hosting more educational events and workshops, I met eco-artists - Paul Brownlee, and Jessica Sim, as well as the FLYING roots team - who initiated the first evolution of Closet Circuit. I first discovered CIRCUIT (at the time, Closet Circuit) while looking for an exhibition venue. Olivia Traut and I were developing an exhibition called the Museum of Garbage, and were in search of a space to realize the project. I approached Ülkü with our proposal, and she was immediately welcoming to the idea and entrusted us with space. 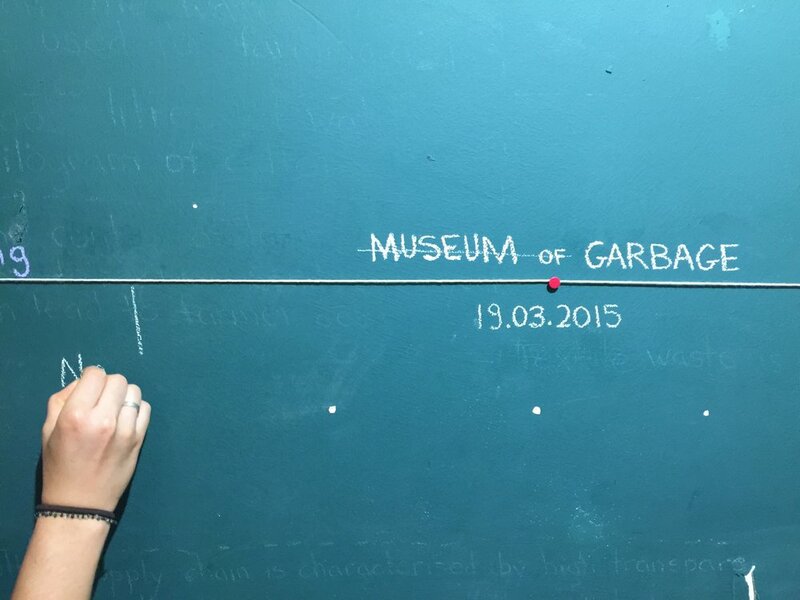 The Museum of Garbage took place in March 2015, and was an exhibition about waste in the city, ‘disposed items gathered from the streets of Çukurcuma and housed in the space of a gallery’. The project addressed a concern for the ecology of waste management in Istanbul and questioned the role of the individual consumer within its complexity. Following the Museum of Garbage, Paul Brownlee, who had assisted with the project, was enthusiastic to continue organising events at the space. With the help of Steffi Kulhmann and Gabrielle Reeves, we began to host community tupperware dinners and life drawing classes. With such events, our aim was to build on Ülkü’s foundation of sustainable creativity. Paul and I have backgrounds in socially engaged art and we sought to develop programming that connected art with sustainability and environmentalism. Our first large-scale event took place in December 2015, with a Holiday Bazaar focused on more sustainable gift-giving. The success of the bazaar took us beyond our expectations and was a turning point in realizing CIRCUIT’s potential. How Does the Psychical Space Shape the Content? Focusing on Creating Patterns of Mindful Living. In 2016, we were told that we would have to move out from the building. We closed our chapter in Çukucuma with a final exhibition, Sehir Ezmesi / City Paste, in March 2016, a collaboration between myself, Paul, and Gabrielle. CIRCUIT’s new space opened in September 2016 in Yeldeğirmeni, sponsored in-part by Sanatorium art gallery and designed by architectural company, GIG. With the move, we rebranded as CIRCUIT Istanbul and established ourselves more officially as an arts and culture organisation, aiming to host programmes and events that encouraged self-inquiry, environmental awareness, and community mindfulness. With the opening of the new space, I joined Paul as co-director and we continued to direct CIRCUIT until July 2017. Özge Mutlu joined as a team member in May 2017. During this chapter, CIRCUIT continued art classes and community dinners, and also developed a yoga program, organised a range of bazaars and art exhibitions [such as Art on a Card], hosted workshops and classes, collaborated on launch events for sustainably-minded brands, and facilitated school programming [such as with IICS]. We also worked on the sustainability of our material usage, developing ways to make garbage and recycling separation a visible process and to integrate eco-friendly packaging and materials into all variety of projects. Paul departed from Istanbul in July 2017 and I continued to direct CIRCUIT independently until July 2018. During this time, I attended a course on Creative Climate Leadership (CCL) organized by Julie’s Bicycle and supported by Creative Europe. The course opened my eyes to new ways of communicating and an international community of like-minded initiatives. Soon after, CIRCUIT received a small grant from CCL to develop our next exhibition. Together with Sinem Sayar and Cansu Yetişgin, we organised Yeşillendirelim - a series of workshops and pop-up exhibition that aimed to bring people together to share experiences about living in the city and to expand Istanbul’s green community. Yeşillendirelim grew our network immensely and led us to imagine and test ideas for what was soon to become Nadas. On a personal level, I am extremely concerned about climate change and weakening connections between people and natural environments. Through the incredible support of Paul, Ülkü, Adnan, and many others, my experience at CIRCUIT has been a journey in finding ways to communicate about these concerns that are inclusive, attractive, and also financially and energetically sustainable. Now as Ülkü returns as primary director, CIRCUIT is stepping into its next chapter. Meanwhile, I am focusing my efforts on the co-founding a new centre, called Nadas. Nadas is a project deeply inspired by CIRCUIT, where I plan to continue to develop arts and culture programming around topics of sustainability within a new context of a creative house and co-working environment. ….. ….. . …. ………….. . . . .. .. … .